Your Kia is great for carrying cargo--but what if you could increase the capability and easily organize cargo? That's where we come in! Visit the parts store at Hanson Kia, serving Hawks Prairie and Lakewood, for your chance to find all kinds of genuine Kia cargo accessories. Whether you're looking for a roof-mounted cargo carrier or an interior cargo organizer, Kia offers many different solutions to help with your cargo. Come by Hanson Kia, serving Tacoma and Puyallup, and see our many different cargo accessories! Hanson Kia, serving Lacey and Tumwater, is proud to be your premiere local, full-service Kia dealer! When your Kia needs new parts, chemicals, and accessories, don't settle for anything less than the best: find the genuine Kia parts that are designed to fit your Kia here at the Hanson Kia parts store! You can find everything you need for your DIY project--or, if you'd rather leave installation to the professionals, you can stop by our service center, which proudly serves Centralia and beyond. If you're in the market for a vehicle, come to Hanson Kia, serving Chehalis, where you can find a great selection of new Kia vehicles available for purchase or lease at great rates and prices--as well as high-quality used and bargain vehicles. 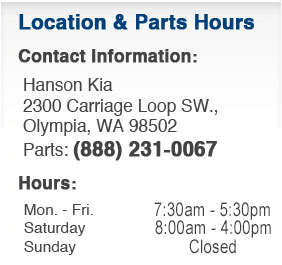 If you have any questions or would like to order parts, give us a call at (888) 231-0067; then, come to the Hanson Kia parts store, located at 2300 Carriage Loop SW, Olympia, WA 98502. We hope to see you soon!